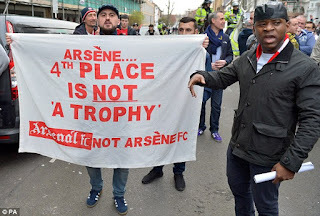 Just as they did before the second leg of our Champions League round of 16 tie with Bayern Munich last Tuesday, hundreds of Arsenal supporters were out to stage a protest before Saturday's game with Lincoln City. Prior to kick-off of the FA Cup quarter-final clash which ended 5-0 in favour of the Gunners, the disgruntled fans came out to demand the sack of Arsene Wenger from the club. The lack of silverware in the last 13 years have become a source of worry for many season ticket holders who now feel a change has to be made soonest. The supporters assembled at the club's old ground Highbury before marching down to the Emirates Stadium holding banners with inscriptions like: "Every good story has an ending. 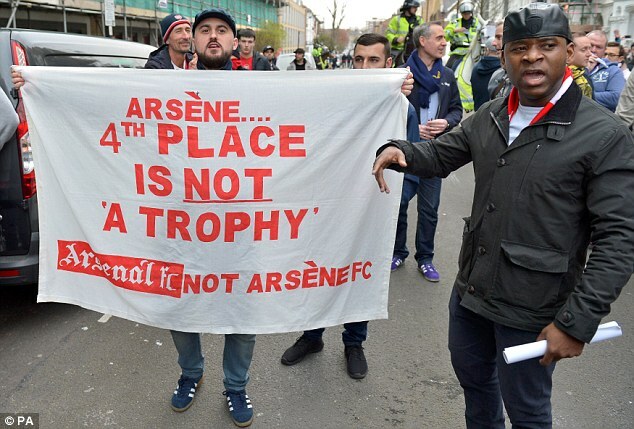 Arsenal not Arsene", "WengerOut", "Arsene... 4th place is not a trophy" etc. Those in attendance also screamed chants to show their disapproval over the Frenchman's extended reign at the club. Below is the video.